Reign sign McPhee, announce camp roster. Iain McPhee became the latest player to sign with the Reign this summer. The defenseman, who turns 26 Saturday, has split his two professional seasons between the Central Hockey League and the International Hockey League. Despite his lack of ECHL experience, McPhee could get a long look. Defenseman Jordan Hill was included on the Manchester Monarchs’ camp roster, released Thursday, and Adrian van de Mosselaer was also excluded from the Reign’s camp roster and could be in the American Hockey League. (AHL camps are already open for business.) Only five defensemen, including McPhee, are expected to be on the ice tomorrow. McPhee played four years in the Ontario Hockey League for the Windsor Spitfires, where he was teammates with future NHLers Bryan Bickell, Steve Downie, Cam Janssen, Cal O’Reilly and Kyle Wellwood. He moved on to the University of Prince Edward Island, posting five goals and 19 points in three years. In his first pro season, 2009-10, McPhee split his time between three IHL teams, notching a goal and four points in 45 games. Last season he had 12 points, all assists, and 79 penalty minutes in 48 games for the CHL’s Allen Americans. One other name was listed on the Reign’s training camp roster, and it’s a familiar one. Mike Thomson of La Habra Heights earned a pro tryout contract — he didn’t have to try out in Riverside, like he did in 2008 and 2010 — and brings four games of ECHL experience this time around. The forward collected two assists and a plus-1 rating during his brief cameo with the Wheeling Nailers last season. Making the opening-day roster is probably a more realistic goal now for Thomson and all the forwards who are here on tryout contracts — Kyle Reed, Dean Yakura, August Aiken and Andrew Monesi. A total of only seven forwards were signed in the off-season by Karl Taylor and Jason Christie, and that’s not enough to fill three lines. Of course, the Kings are expected to kick down some help this season, and that could include a forward (or two). Odds are, that forward is going to be in Manchester’s camp until the Kings make their final training-camp cuts, which are expected to come in the next week. The same goes for any NHL-contracted defensemen and goalies who will find their way to Ontario this year. Finishing touches; players officially report tomorrow. The Reign players officially report to training camp tomorrow for their physicals. On Friday, on-ice activities begin behind the closed doors of CBBA. Team President Justin Kemp told me that the main reason camp won’t be at Center Ice Arena (where it’s open to the public) is that it’s cheaper to practice on your own rink. Of course your home rink has to be available, too, and the CBBA surface isn’t needed for anything other than Reign hockey in the coming mornings. Training camp will be closed to the public. In case there hasn’t been enough change around the Ontario Reign, here’s one more: Training camp will be closed to the public this year. Players are due to report Wednesday for physicals and on-ice activities are scheduled to begin Friday at Citizens Business Bank Arena. The first three camps were conducted (at least in part) at Center Ice Arena on Plum Street in the old “downtown” Ontario. 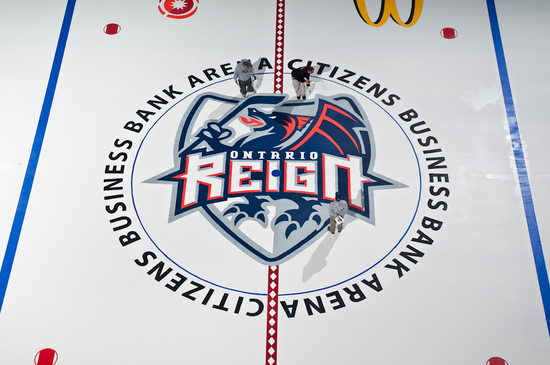 If you’ve ever skated at Center Ice Arena, you’ll know the quality of ice is not as high as that of CBBA. Plus, players probably won’t mind not having to pack their equipment into their cars, and drive four miles each way just to do on-ice conditioning and drills. While I wait for the official explanation for the move, I’m curious to know from fans: Would you rather get your first look at the team running drills at Center Ice Arena? Or would you rather know they’re tucked away in their own rink on the better ice surface? San Francisco Bulls, Part 2. The ECHL waited until today to make its formal announcement about the San Francisco Bulls joining the league in 2012-13. It appears one small correction is in order: Pat Curcio, former assistant coach of the Ontario Hockey League’s London Knights, leads the ownership group, not Shmuel Farhi. Farhi and media personality Jim Chapman are “also part of the group,” per the team’s official release. Curcio will also be the team’s head coach and general manager. San Francisco Bulls almost up and running. Update. The ECHL Board of Governors approved the addition of an expansion team, the San Francisco Bulls, to begin play in 2012-13. David Pollak, the Sharks beat writer for the San Jose Mercury News, wrote on Twitter that the Bulls will play in the Cow Palace, the Sharks’ home arena in 1991-92 and 1992-93. Few other details are available at this moment, including who will own the team and how the Bulls will fit in to an eight-team Western Conference. Reign President Justin Kemp is at the Board meeting in Atlanta and wasn’t immediately available for comment. Kemp has repeatedly said in the past that the Western Conference was hoping to expand (the Eastern Conference has 12 teams by contrast), but never mentioned San Francisco as a potential market. So it’s likely that the ownership group was a recent entry into the ECHL foray. Update: Kemp gave me some more details about the Bulls, most of which will appear in tomorrow’s editions of the Sun and Daily Bulletin. He said that he wasn’t aware of the ownership group’s emergence until the Board of Governors agenda crossed his desk “about a week ago.” All but one of the 20 Governors approved the Bulls’ membership.